What can I do with D3Tool right now? Make a great occlusal splint. While the long term vision of D3Tool is a more general purpose and open platform for dental CAD tasks, the clear goal for today is a simple, effective and low cost occlusal splint module. 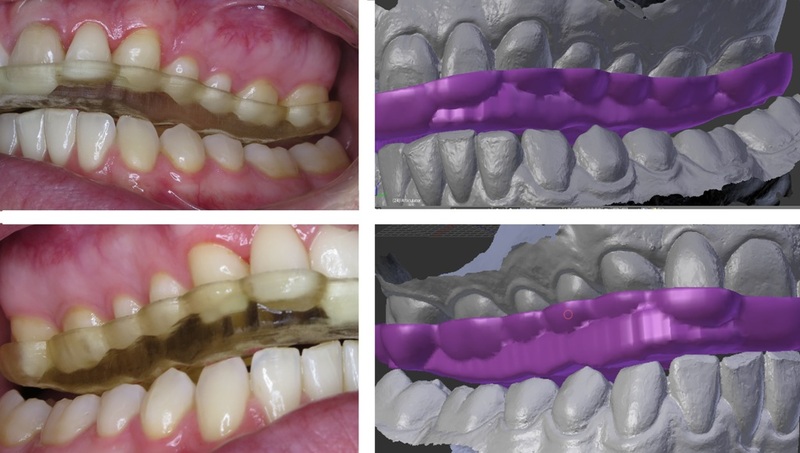 The resins are there, the printers are there, but until now, the CAD is not there unless you are willing to dive into the professional dental CAD packages. It’s a wide open hole! This is why splints and guards have been the aim for an initial release. This is best demonstrated with a time-lapse. Right now, a simple guard for a reasonably normal occlusal scheme should take about 10 minutes. Our goal as we refine the workflow is a 3 minute design that has full control over the occlusal scheme (guidance, excursions, disclusion, balance etc). So good I’m a little nervous. My initial test of about 6 guards have all fit the teeth well with no internal adjustments. I attribute the excellent fits to the quality of the input data and the quality of current desktop 3d printing technology. From a CAD point of view, the concept of fit is simple. Subtract the teeth from the desired outer shape with a small offset. So if the input data is good, and the manufacturing is good, then not much refinement is needed other than choosing your offset. Pretty darn good! The main limitation right now, is that the articulation simulations are dependent on the fidelity of the estimated parameters (condylar inclination, incisal guidance, Bennet angle, facebow mounting). The occlusal scheme seems to be on par as if you sent physical models to the lab, asked for an average value mounting on a semi-adjustable articulator. Below is a gallery of my first 4 test splints with no occlusal adjustment. There is no question that the MIP bite is as good as your bite registration. The excursions have been very close, but I can tell that in some cases, the average values have not matched the patient perfectly. What are the next steps for D3Splint? The tool is good, but it definitely has the potential to be excellent. In no particular order, the main developement goals to make this go from a beta to a polished module. Yep, you read that right! Download the MeshMixer TypeWriter Tool – programmed by Dr. Dave Franks! It would help a lot to trust and solve doubts if it was possible to contact you by email, but unfortunately i could not find any email address on your website. How many computers can the software be installed on per license? I’m thinking three at minimum for my personal needs. I’m struggling with the design process for an occlusal splint using the Mac software. I’ve watched several videos online and followed each step using .stl scans on multiple patients and haven’t had any success. Is there a difference between the Mac software vs. Windows? Should I switch? When designing the occlusal guard does your software open the arches? Should the scan of the bite be taken in MIP/CR or with a pre-determined position using blue bite, cotton roll, bite stick etc? I prefer to scan the bite in an open position. That way I know that the patient actually has that open position. If I try to open the arches in the software, I’m not guaranteed that that position is an actual jaw position. My preference for taking the open bite scan is a single anterior discluding element (leaf gauge, specifically). By using a single anterior stop, I can scan the posterior segments without interferences and the single stop creates uniform spacing. If I use bilateral cotton rolls, the patient can bite differently when I scan each side. I’ve found the leaf gauge to be the most predictable, quickest, repeatable, and economical way to take the bite scan. Would you consider a virtual articulator that mounts to the HIP For advance TMJ doctors?